If Breakfast at Tiffany’s took place in Palm Springs, then Kelly Lee’s style could be mistaken for Holly Golightly’s any day of the week. 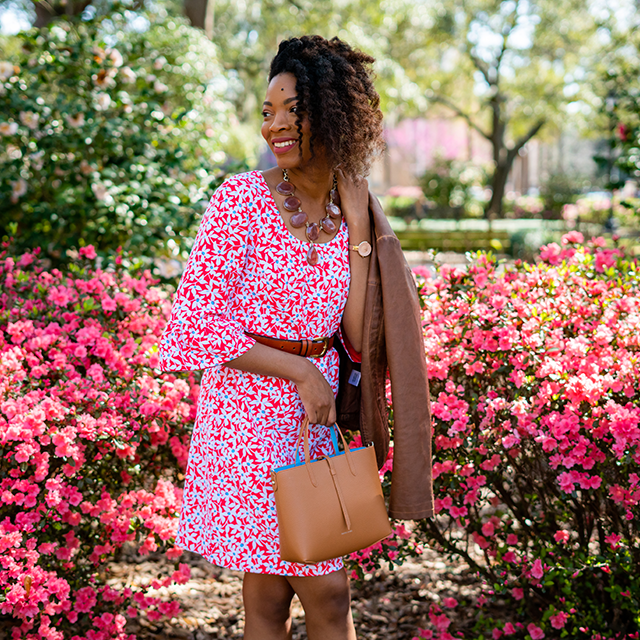 On her blog, aptly named Kelly Golightly, Kelly channels Audrey Hepburn in full California color. Her look is flawlessly pulled together, yet brilliantly and outrageously fun. Given her knack for lending polish to any piece, we asked Kelly to style three pairs of shorts—those tricky wardrobe items that can often walk a fine line between chic and sloppy. 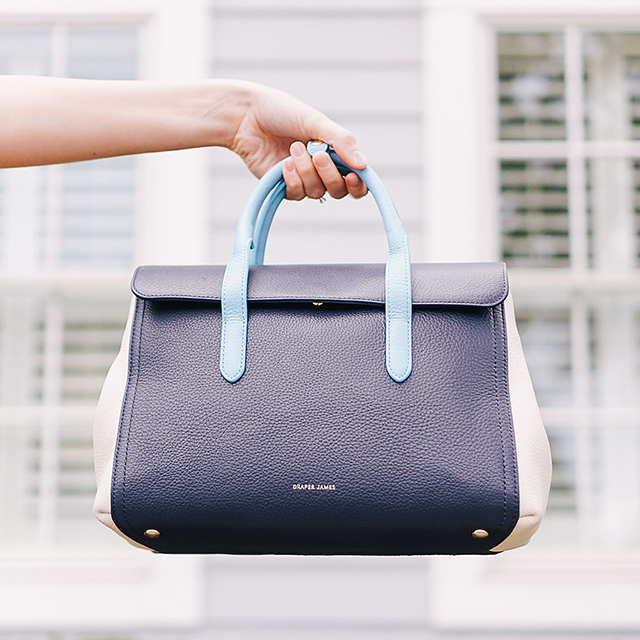 The pitch-perfect (and so totally chic!) looks she pulled together were made even more glamorous by the backdrop of Palm Springs, where Kelly and her photographer husband, Fred Moser, just bought a new house. 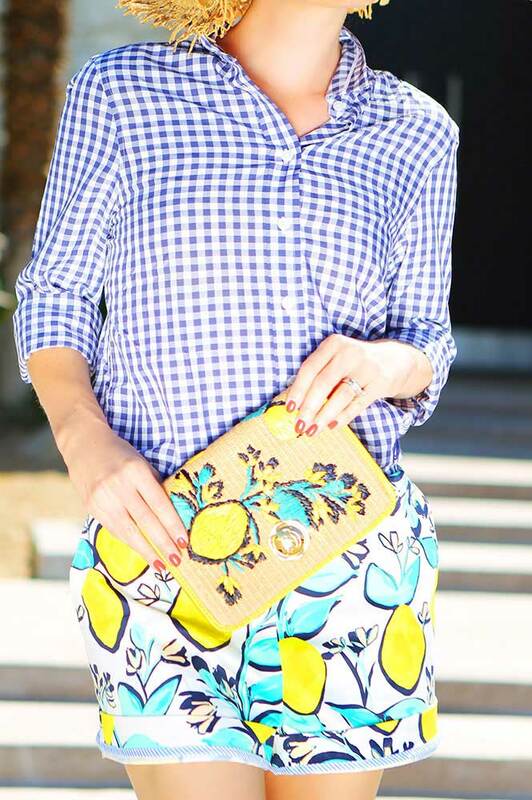 Blogger Kelly Lee of Kelly Golightly pairs our Solid Bristol Short with our Lemon Orchard Nashville Top and Straw Lemon Clutch. All photos by Fred Moser. Find Kelly on Instagram @kellygolightly and Fred at @fredbaby13. Confessing she’s “obsessed with all things lemons,” Kelly incorporated our Lemon Orchard print again. 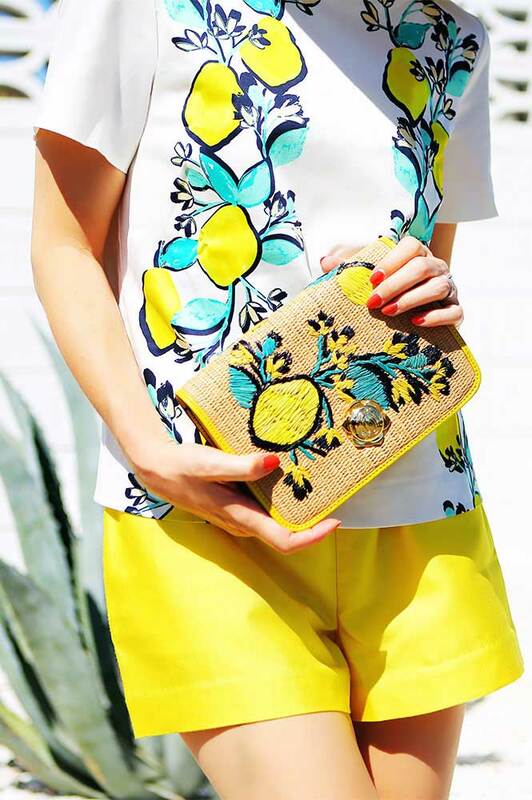 This time, she wore our Lemon Orchard Bristol Short with our Elliot Shirt and the Straw Lemon Clutch. Kelly worked in a third pair of shorts—this time it was our Sarabeth Seersucker Short—pairing it with the Lemon Orchard Nashville Top and Straw Lemon Clutch, and elevating the look (literally) with a pair of tall wedges. Not long ago, shorts were considered ultra-casual-wear. But these three pairs of shorts are tailored and can even skew a bit dressy! Tips for dressing up shorts? I love these Draper James shorts because they are tailored and sophisticated with impeccable detailing and fabric. They are dressy enough to wear out to dinner when paired with a heel or flat, but are comfortable enough for bopping around town visiting open houses (my favorite pastime!). Can you describe each of the three Draper James shorts looks you styled for us? For the first look, I paired yellow shorts with a lemon-print top (that reminds me of roaming around Capri), an oversized sunhat, sunnies, low-heeled sandals, and this must-have lemon-print bag. I am obsessed with all things lemons! For the second look, I paired the lemon-print shorts with a classic button-down gingham top in navy and white, a straw hat, sunnies, low-heeled sandals, and the same lemon-print bag. For the third look, I styled seersucker shorts with the lemon-print top and lemon bag, playful yellow sunglasses, and sky-high light blue wedges—which elevate this look both literally and figuratively. I love anything seersucker; it’s just so nostalgic, classic, and fresh. What’s fun is that you could swap out the tops on any of these looks. These are super-versatile and classic pieces I’ll have for ages. If you want to dress up any of these looks even more, drape a navy blazer over your shoulders and you’re set. Three tips for styling and shopping for shorts? 1. For me, comfort is key when shopping for shorts, and my secret is that I like to buy mine one size up for a more effortless look that still looks put together. In the case of the Draper James lemon-print shorts, for example, I wore a size that was loose enough that I could roll them up to reveal the most darling detail. 2. You typically think of shorts with a tee, but that never quite makes me feel pulled together. A gingham top is just as comfortable and looks a billion times better. So classic and chic. 3. I always ask myself two questions when shopping: First, do I love it? And second, does it love me? I only buy things I absolutely love, and once I saw the lemon-print, happy yellow hue, and classic seersucker, I was smitten. Does it love me just means: Does this actually look good on me and make me feel good? I say if you love it and it loves you back, go for it!